We’ll keep things short and sweet today, which seems appropriate considering that we’re writing about Pineapple Coconut Smoothies. Simple ingredient list (three, including ice cubes); simple steps (put ingredients into the blender and purée). But we deserve simple because today is the first day of The Stout Sprout’s summer vacation. The last day of the 2013-2014 school year was this past Tuesday and both our Sprouts are treating this first day of summer break like Christmas morning. No alarm clock, no lunches to pack, no backpacks to load up. Ah, the life…at least until summer camp begins. What better way to celebrate the day than with a tropical treat combining fresh, sweet pineapple with creamy coconut milk. Thrown in the blender with some ice cubes and the resulting smoothie is a G-rated drink reminiscent of a piña colada but specifically tailored to the under-21 crowd. In the United States, canned coconut milk is a combination of what, in some other countries, is known as “thick” and “thin” coconut milk. 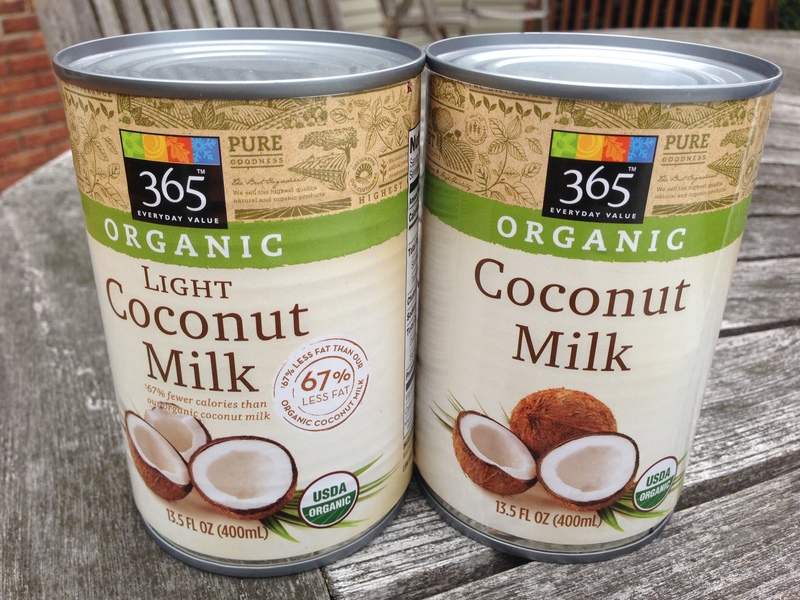 You can normally find either regular or light canned coconut milk, with the light variety containing less fat than the regular variety. For this recipe you can use either, though regular coconut milk will produce the creamiest smoothies. If you’re watching calories, go for the light variety because a whole can of that contains about 240 calories, where a full-fat can contains 720 calories*. A pretty significant difference! Light coconut milk weighs in at 240 calories per can; regular at 720. 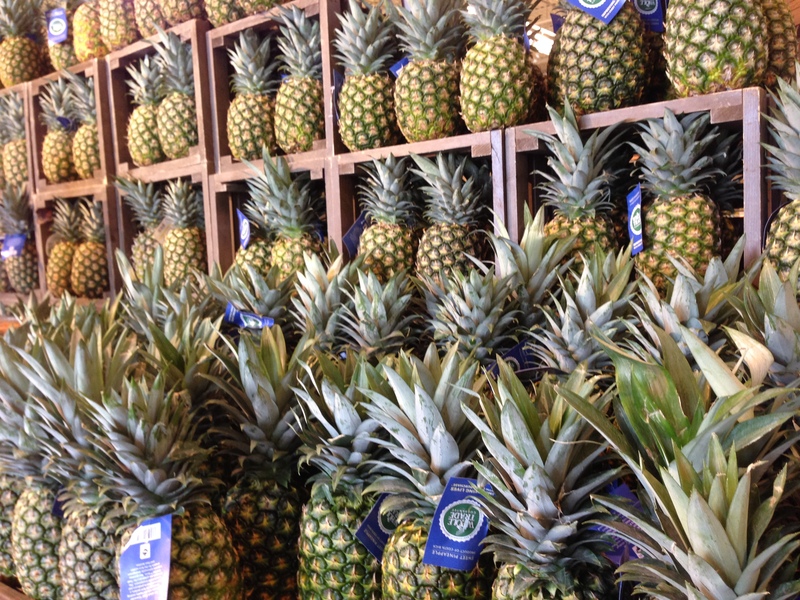 Use the freshest pineapple you can find, cutting and coring your own if you can. Our Whole Foods carries fair-trade pineapples that are so inexpensive I find myself picking one up every week or two because they are so good. Trimming and coring a pineapple is easy after you’ve done it once or twice: cut off the top and bottom, cut off the outer skin, and then halve the pineapple lengthwise, and halve the halves one more time so you have four pineapple wedges. You’ll see a light yellow core that is easily trimmed away, leaving you with four wonderfully juicy pineapple planks that can now be cut into cubes. I do this by the sink because it is a sticky sweet task with the juiciest of pineapples. If you want to mix things up a little, try adding a banana (frozen if you have one) to the mix along with the other ingredients. 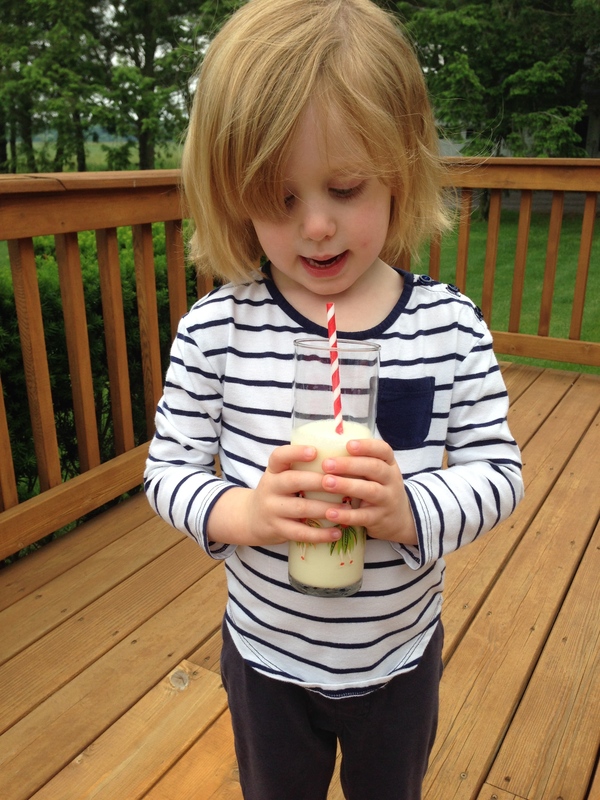 Daughter 2 actually requested hers that way after she took a sip of the plain pineapple coconut version…and I later found a Paula Deen recipe online for Piña Colada Smoothies that used this very trick. At least the kid knows what she likes! 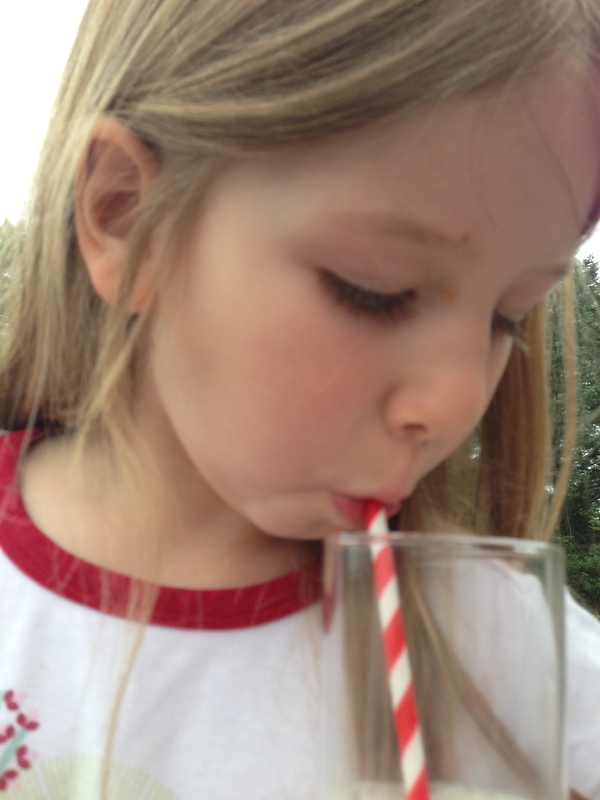 Ultimately, she decided she liked her smoothie with banana, too. My only regret in making these smoothies is that I didn’t have any drink umbrellas on hand to liven things up, but I did have some wonderful hula glasses my husband and I got as a wedding present. These truly do taste like a mini vacation for your mouth, especially if you can’t get away to a sandy beach somewhere. Just the thing for the first day of summer break. And the second. And the third. 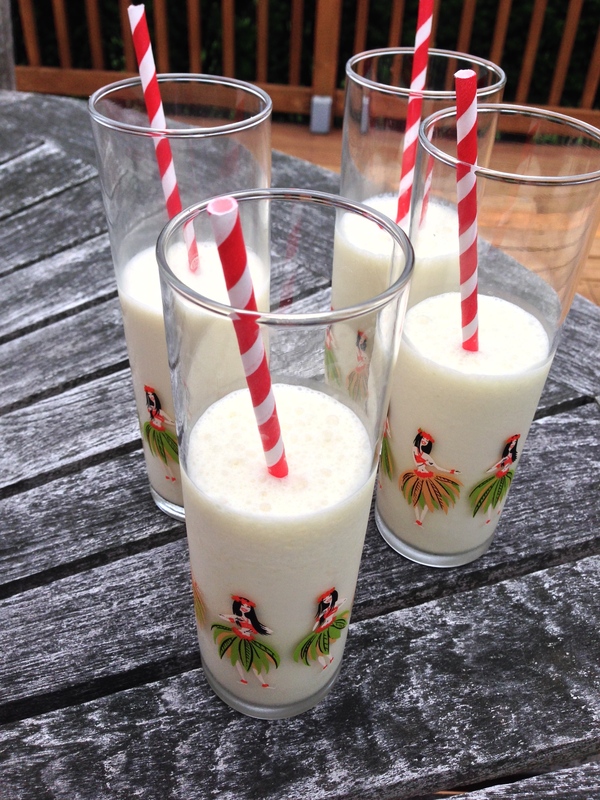 Pineapple coconut smoothies — must be a party! Liquify the coconut milk, pineapple chunks and ice cubes in a sturdy blender until ingredients reach a smooth consistency. Pour into glasses and serve with a straw. Kid rating: four-and-a-half stars. Daughter 1 loved this smoothie had two servings, though Daughter 2 ultimately decided that she preferred hers with bananas to cut down on the coconut taste (go figure). 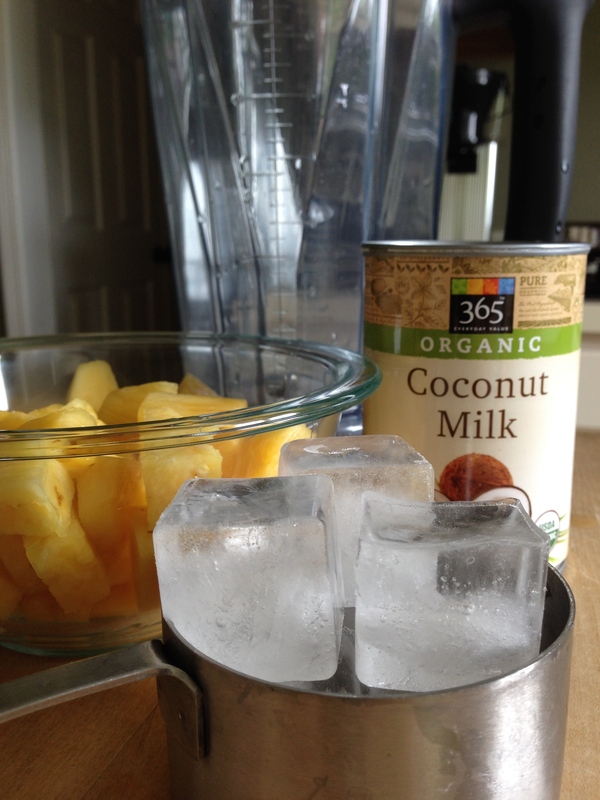 If you use light coconut milk and fresh pineapple, this is a healthy and satisfying cooler that you can feel good about serving to your kids. Parent rating: four-and-a-half stars for this vegetarian, vegan treat. 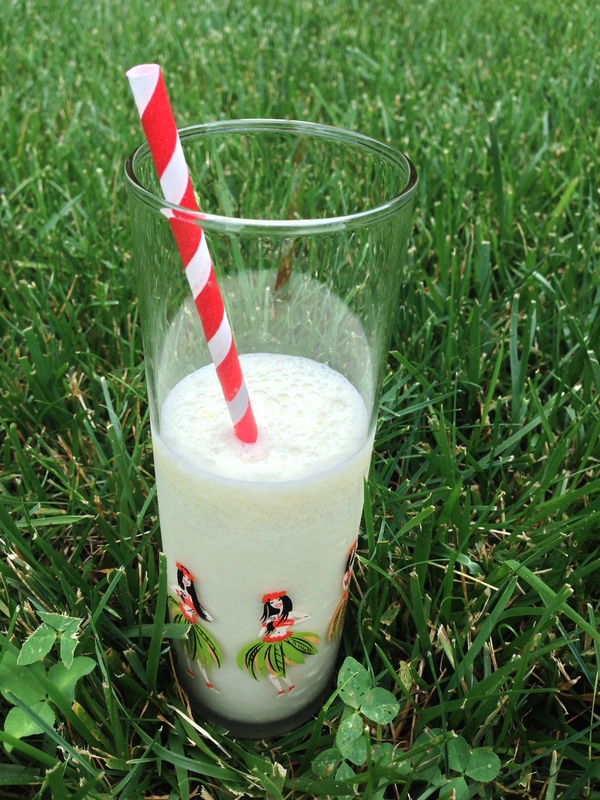 This smoothie is like the tropics in a cup, sweet and creamy. Just the thing for cooling off on a warm summer day. Just don’t forget the drink umbrellas.